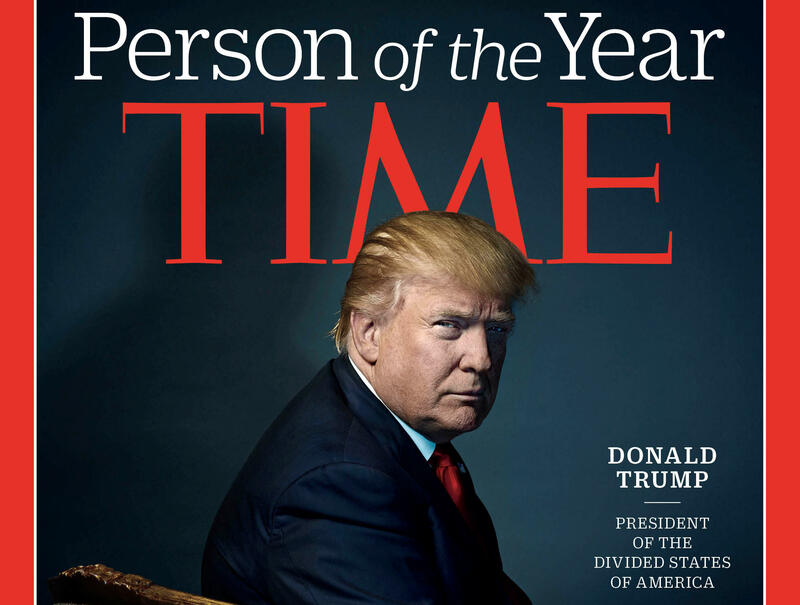 That was a reference to Time’s cover line - “Donald Trump: President of the Divided States of America” - that was positioned next to the cover photograph of the president-elect sitting in his private residence at Trump Tower. Mr. Trump climbed from fiery underdog in the race for the GOP presidential nomination to winning the White House and defeating Democrat Hillary Clinton in the Nov. 8 election. Mr. Trump won 306 electoral votes, easily enough to make him president when the electors meet on Dec. 19. Clinton won the popular vote. He won in part by articulating in blunt, populist terms the racial, economic and other factors that divide Americans, many of whom have not felt the nation’s recovery from recession. Mr. Trump stomped campaign traditions and social norms, including by insulting women, Muslims, Republican leaders, a reporter with disabilities and more. He also praised Russian President Vladimir Putin and last week irritated China and broke diplomatic norms by speaking by phone with the leader of Taiwan.